You know, by nature I am really an optimist - always looking on the bright side of things and making the best out of situations (unless I am hungry - that is a whole other state of mind I can't even get into). But I am really starting to lose faith in the Bushwick trains as they annoyingly seem set in their service-change ways and don't really show any signs of improving in the near future (I'm still praying for a miracle!). Does anyone remember the last time all three Bushwick trains were running fabulously?…Didn't think so. (M train is going to make us all late for a very important date, but it is all like "Frankly, my dear, I don't give a damn". Typical). So there you have it - your weekly dose of mass transit headache! 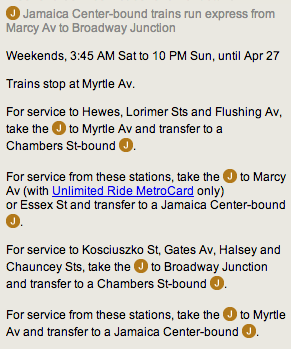 Check mta.info for any last minute updates and, as always, Happy Riding!